I've seen plenty of rumors hinting at Omar Sy as Bishop and Booboo Stewart as Warpath. We'll have to wait for official confirmation. Hate to bring in the skepticism this early, but both Bishop and Warpath are HUGE guys. Guys you wouldn't want to f*ck around with because they could crush you with a punch, and these 2 aren't what you'd call beefed up. I would figure Michael Jai White or rapper Common would work for Bishop, and even though he's not Native American, Jason Momoa as Warpath. It looks like Bryan Singer is pulling a Brett Ratner for the upcoming film. Seriously, it's like he's squeezing in every single damn character that's even been considered for a part in the comics. It feels a bit out of hand. The number is becoming quite staggering. With the more recent additions it makes me wonder if Trevor Fitzroy, Ahab, Rachel Summers, or Cable will show up. Rachel Summers might be tough because Cyclops and Jean Grey are both gone. 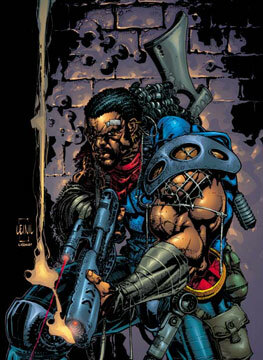 Cable could work if they used the Ultimate Marvel Universe version (an older healing power gone Wolverine). Even if he shows up I would totally cast Stephen Lang. He's got the look and attitude of an old soldier. Either way As soon as Unus the Untouchable and Maggot are cast, that's when I'll refuse to see this. PS: Has he decided to resurrect Cyclops, bring back Gambit, and open Deadpool's mouth yet? Only time will tell. 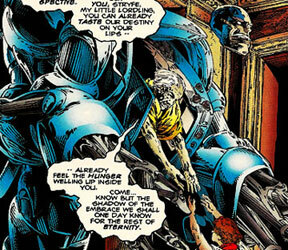 PPS: I wonder if Peter Dinklage is playing the Apocalypse from the Books of Askani'son. The En Sabah Nur of Earth 4935. Here's a pic from the comic to give you an idea why I would think this.